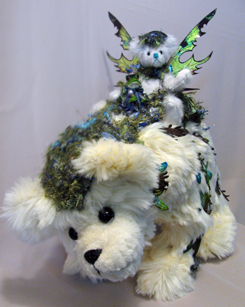 Pat Lyons, of Free Spirit Creations, first found her love of bears when she met her future husband, Eddie. She was on vacation in the Grand Canyon where he worked at the time, and he sold her a stone-carved fetish bear that still lives with them today. 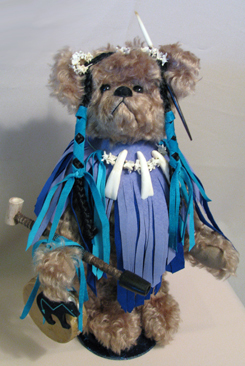 The Native Americans believe the bear holds a specific spirit within. This would be Pat's first bear and explains Pat's deep attachment to all the bears she makes, adding a bit of herself in every bear. 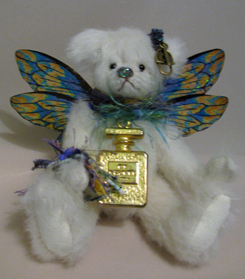 Pat began her bear making in 1990, in a Florida bear shop she owned, called 'Bear-ly Ours'. 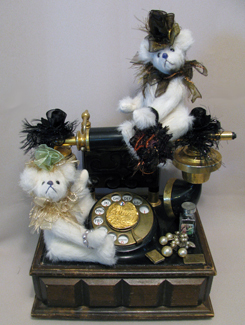 Her business provided her the opportunity to meet many teddy bear artists and collectors. When Diane Gard offered to teach Pat her techniques and skills, Pat took her up on the offer. Working diligently and creating many bears and two years later, Pat's bears were on the cover of Teddy Bear Review with a 3-page article inside. up-turned nose made with layers of embroidery floss and a small pebble from Arizona sewn into the left ear, which you can't see but you can feel. 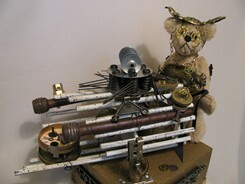 "Bears are magical and they hold the wand to our hearts. 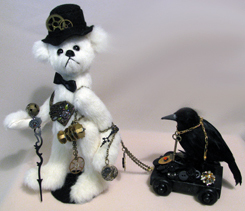 The connection between artist, bear and collector is a 'bond' that words can't explain," said Pat, who describes her process as letting the 'free' take over her spirit. 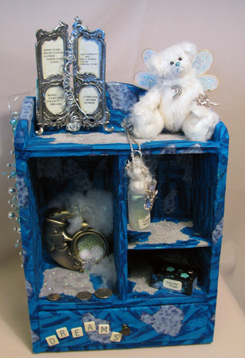 This is the inspiration for her business name Free Spirit Creations, formerly Free Spirit Bears. 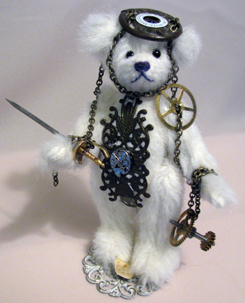 Pat is always pleasantly surprised by the end result of her bear making. 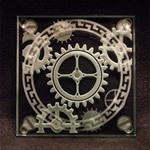 Beside bears, Pat makes fiber art, cloth art dolls, metal assemblages using metal jewelry in the style called 'Steampunk' which is defined as a Victorian Sci-fi mix often created with watch and clock parts. 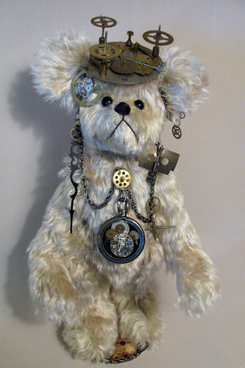 Some of her bears are made with the accessories from the Victorian era and some bears wear goggles and hats. Others have gadgets to tinker with. a sparkle in her eye! 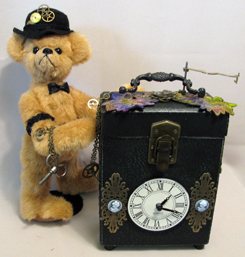 Pat's favorite bear, Humphrey was created in 1993 in Flagstaff, Arizona and named for Humphrey’s Peak, which is the highest elevation in the State. His vest holds pins from places he has visited with Pat and Eddie. Humphrey even has his own photo album capturing his adventures. "Humphrey dances to a different drum, but so does his Mom," Pat added. 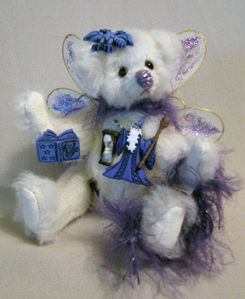 Pat has been featured in several books, feature articles and her artwork along with her teddy bears can be found on her web site. 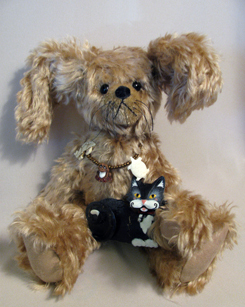 You can also find Pat at leading craft and teddy bear shows too.